Quick tip for the weekend: Cook something. This was just a quick dinner using leftover raw chicken and Portobello mushrooms. I had planned to use the mushrooms for a really unique creation I have in my head, but it I’m still working out the details. So since my first trial fell through, I figured I would use those mushrooms before they go bad. I want to say it’s kind of like stroganoff, but it didn’t really have sour cream so it tasted a bit different. Let me break it down what I did. All you will need is, butterflied chicken breast, portobello or any other mushrooms, paprika, heavy cream, rosemary, garlic, and lemon juice. First season the chicken with salt and pepper paprika. Paprika always stains my cutting boards, I need to find a different way of seasoning it! In a pan on medium high, throw in some olive oil and sear the chicken on both sides. About 3 to 4 minutes on each side or until golden brown. Then remove the chicken and drop in the mushrooms and cook down. I cut the mushrooms into big slices because I wanted it to have a real good bite to it. After cooking for 2 or 3 minutes, throw in 2 whole crushed garlic cloves, and 2 sprigs of rosemary. Toss for another minute and then deglaze with wine, (you can just use water or stock). Let reduce for a minute and then add heavy cream, and about half as much as the liquid in the pan. Reduce the heat to low, and then return the chicken to the pan to finish cooking. Cover and simmer for a couple of minutes. And that’s it! Again a nice real quick meal that anyone can make. I wouldn’t call it a “Quick Nom” but it doesn’t get any easier than this! It’s the weekend for go cook something! 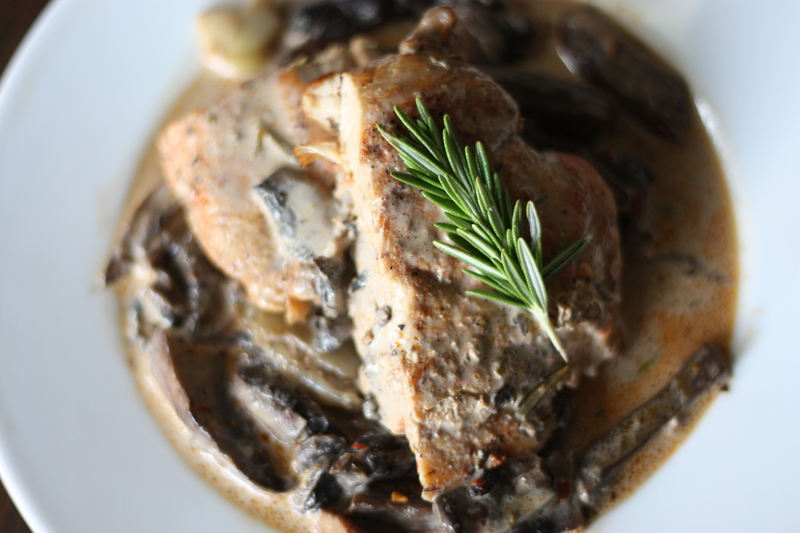 This entry was posted on March 9, 2012 by rrfoods in Chicken, Dinner and tagged chicken, cream, portobella mushrooms.